Linen is a fabric used for all kinds of purposes, mostly clothing and decoration, that is appreciated for its durability, naturalness and freshness. Linen is manufactured from the fibres of the flax plant which is grown throughout the whole world - from Canada to Ethiopia. Flax has been cultivated since the times of ancient Egypt and ancient Ethiopia, while the latest findings of dyed flax fibres date to 30000 BC. In Lithuania, a small country in Northern Europe with a very rich history, linen has a special place in the nation's traditions, arts and crafts. Flax has been grown here since the times of the Baltic tribes that were living in the modern country's territory from around 2000 BC. In the Medieval times, when the Grand Duchy of Lithuania was one of the largest countries in Europe, linen was probably the only fabric used for clothing by the peasants and the warriors (except for the armour, of course). Even in the early 20th century, when the availability of other fabrics was much greater, flax and linen had a major part in Lithuania's exports. The significance of linen in Lithuania has diminished ever since, yet there are still some folk artists in the country who weave linen and keep the traditions alive. The importance of linen to a Lithuanian can be clearly seen in the folk songs - one of the greatest and most significant parts of the Lithuanian heritage. Up to the mid-20th century, people had sung songs on every occasion, including the seeding and cutting of flax and weaving of linen. Linen also appears in other folk songs, such as the ones about war or marriage, and is used as a symbol of prosperity and well-being. Apart from the folk songs, Lithuanians even have an annual celebration, commemorating the importance of flax and linen. 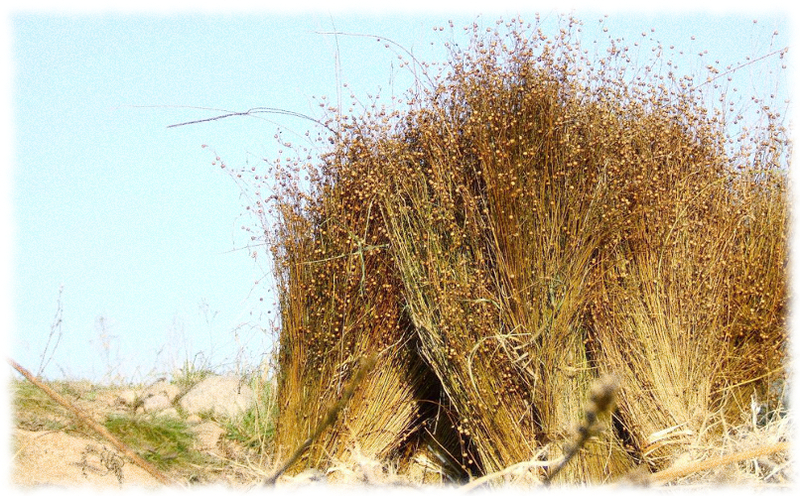 "Flax is one of the oldest cultures cultivated in Lithuania, and it is unjustly forgotten. Even our ancestors knew about the miraculous healing qualities of linen. Linen had a very important part in the formation of the Lithuanian attitude of mind." - says Zenonas Macernis, one of the organisers of the Festival of Flax, celebrated every year in the village of Budraiciai. In this festival, artisans and craftsmen who work with linen come from all parts of Lithuania to share their experience and sell their hand-made clothes, toys, tablecloths, towels and other kinds of items. No traditional festival in Lithuania is celebrated without songs and dances, so a lot of folk ensembles come here as well. In every part of Lithuania, the traditions of seeding and cutting the linen were different. The greatest similarity of traditions from different regions is that the cutting of flax was usually a work done by women. Unsurprisingly, a lot of songs were sung during the process, and some of these songs even survived until our days. Some of the more interesting traditions come from Zemaitija, the North-Western region of Lithuania. For example, when the cutting of flax was over, the cutters always waited for a rabbit to come out of the field. Sometimes, the more shifty cutters managed to catch the rabbit, thus earning the family a delicious dinner. There have been a lot of beliefs of how and when to seed the flax to get the best results. For example, in the village of Dadotkai, flax was seeded in the end of May, but only when the junipers are dusty, when the Moon is in its gibbous shape and when the wind blows from the South. Quite a lot of conditions, isn't it? When the flax is prepared to be made into linen, once again it's up to the Lithuanian women to do all the work. From the ancient times, the man of the house had to be able to tend to the horses and other animals and supervise the cultivation of crops, while the woman had to have cooking, weaving and spinning skills. There was a spinning wheel in every house, and in the evenings the linen was made into clothes, towels and other everyday items. At that time, linen was the most prominent fabric used for clothes by everyone living in the countryside. It was completely natural and made locally - people wore clothes made from linen grown in their own fields. Nowadays, linen clothes associate with people having holidays in the French Riviera and not with a simple farmer living in the countryside. This transition happened some time in the 20th century, when the supply of other cheaper fabrics increased significantly and the cultivation of flax became much less profitable than before. Fortunately, there are still some people who cultivate flax and produce hand-made linen items, but their number has decreased dramatically over the years. In general, the traditions of cultivating flax and making linen clothes were close to extinction in Lithuania, but nowadays there are more and more people who remember their heritage and decide to keep the traditions alive. The demand of natural hand-made linen clothes is growing, so fortunately this trade still has a future. Saving this craft is very important to Lithuanian heritage, as together with the linen making itself, it also carries a lot of other traditions, such as songs, dances, festivals and the Lithuanian attitude of mind.